Fishing Report October 31, 2011 Jeff Sundin Walleye Fishing in Northern Minnesota was good for us on Sunday. With calm seas and temps in the mid 40's, it was downright nice out there. Fishing with the Espesets, Paul, Bob and Drew, Walleyes were the choice and since it's been a while since my last trip, we decided to go back to the last, best spot. Turned out that it was a good idea, the fish were still in the area and in spite of calm conditions, they remained active in shallow water for most of the day. When we arrived, the surface temperature was hovering at 45 degrees and there was just enough breeze to make a slow drift along the breakline from 7 to 12 feet of water. It didn't take all that long before one of the boys, Bob I think, hooked our first Walleye, a nice keeper in the 16 inch range. The fish were holding on the break at about ten feet and while the action wasn't fast, it was steady for sure. There was one black cloud moving toward us and as it approached, it kicked up a little extra wind and spit a few drops of rain. During the turbulence, the fish moved shallower, up on top of the rock flat in about 8 feet of water. The action got faster for a little while, but when the cloud passed and the surface got calm, the action went back to slow-but-steady. Presentaion was as simple as it gets, 1/8 ounce jigs tipped with larger than average Fatheads or Rainbow Chubs. We couldn't get any shiners, but they probably would have worked too. Even though the water was cold, the fish preferred to see a fairly aggrerssive jigging style. After they struck tough, they needed to be teased along for a while before setting the hook. Trying to set too fast, caused us several missed fish, especially early in the day. We really couldn't have asked for better timing. The action remained consistent all morning and into the mid afternoon. 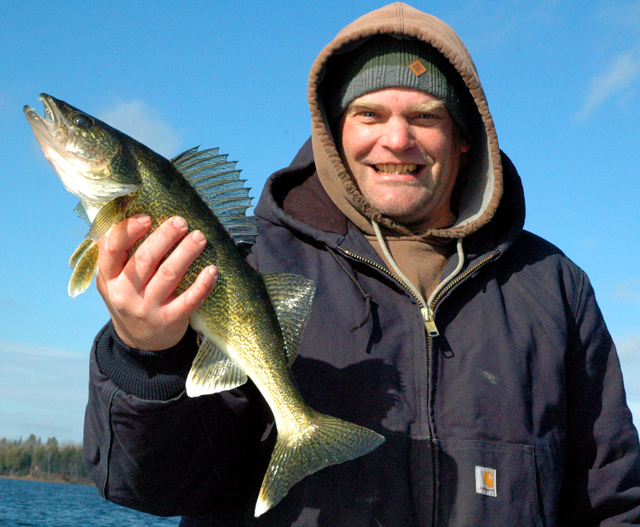 We poked around on that same flat until about 2:00 PM when Paul reeled in a scrappy Walleye. That was it, he dropped number 24 into the livewell and by now it was a perfect excuse to go cook our shore lunch. After lunch we still had a little time to kill, so we headed toward Little Ball Club hoping to find one school of Crappies that we could pester. Except for one or two half hearted bites, the Crappies weren't cooperating and darkness overtook us before I found an active school. One more fishing trip today and we're hoping to try something special, maybe a little linker hunting. I'm not sure where we'll wind up, maybe on the grid, maybe off of it. Wave if you see us go by and be sure to watch for a report tomorrow morning. Fishing Report October 30, 2011 Jeff Sundin Just a couple of quick notes this morning. I'm not getting a lot of fishing updates right now because most folks are preparing for next weekends Deer Hunting Opener. Of the reports I am getting, most folks that are still fishing have been targeting Walleyes. Cutfoot Sioux has been reliable, but not fast during the past week. Fish are being caught though and it is a viable option if you want to get out there today. Rainy River anglers are catching good numbers of fish, but so far, not a lot of really big fish have been coming in. Water levels are reported to be low, but fishable. I'm planning to fish Walleyes today and I will probably head back to the last lake I fished before I left for hunting. Depending on how my day goes today, I may head up to the river tomorrow, just to see for myself. Either way, I'll have a full update for you tomorrow, again on Tuesday and after that, we'll focus on the upcoming ice fishing season. Fishing Report October 29, 2011 Jeff Sundin You may recall that a couple of weeks ago I mentioned a Camo bag that turned up missing from my boat. I was really disappointed that we didn't find it because it meant a lot to the owner, David Chrz and the owner, David meant a lot to me. I would love to have been able to return that bag to him, but it was never found. I'm afraid that this time we've lost something even more precious. Yesterday we lost David himself. David's passing was apparently peaceful and mercifully fast, he died in his sleep some time early Friday morning. David J. Chrz was a man who went so far beyond being an ordinary fishing customer that I had trouble calling him that. Not only was he a great friend, he was one of my best friends! He was a loyal fan and a follower of the ups and downs of my life, he was one of those people who actually cared! Just a day before his passing, he'd emailed me, offering some sage advice on how I could work to improve this very page! Over the years, David brought along a parade of folks that were important to him and many of them, have turned out to be great friends too! I'm setting up a page where we can all visit when we feel like re-living those times. Click here to view. David's Brother in Law, Eldon Skoglund put it best when he said; "Fall is never going to be the same around here". We're sure going to miss you David! Fishing Report October 28, 2011 Jeff Sundin I have a couple of more fishing charters scheduled for the weekend, so I'll have at least one more open water update coming soon. So far, I've managed to pick up a few tidbits about fishing. While I'm at it, here is a little slide show of highlights from the North Dakota Trip. 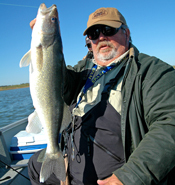 (10/28) On Lake Winnie and Cutfoot Sioux, Daytime Walleye action is still sluggish. There are some fish hitting on the main points and bars in Cutfoot, but for consistent action, evening is by far the better time to fish. During the daytime, try Lindy Rigging with large minnows in the 22 to 28 foot range. As the sun goes down, switch to jig and minnow presentations and move shallower, 8 to 12 feet is a key on most of the spots. 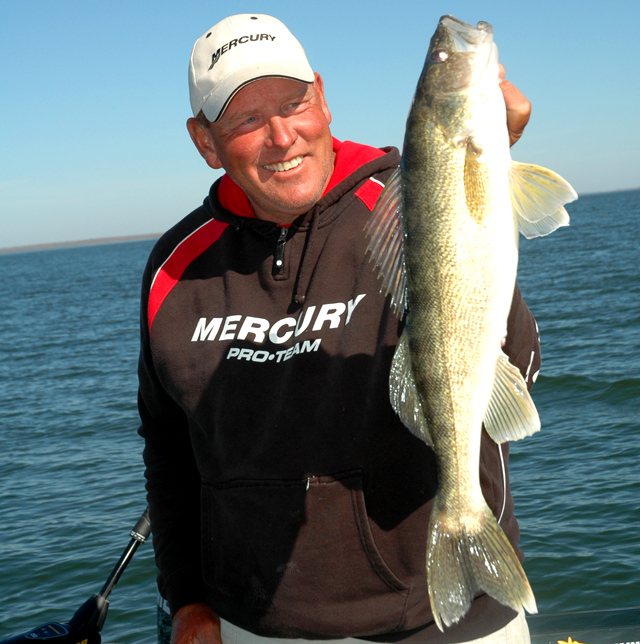 (10/28) On Leech Lake, wind exposed rock continues to be the key location for Walleyes. Breeze makes the fishing better, especially during the daytime as the current activates fish. Perch and Walleyes are also mixed in the deeper weeds as well. Portage Bay, Sucker Bay and portions of Boy Bay where weeds in the 8 to 11 foot range are holding schools of fish. (10/28) On Lake of the Woods and the Rainy River, Mike Kinsella at Border View Lodge says; "Schools of fish are finally making their way into the river. Finding the right spot at the right time is the trick right now. Lots of nice fish are being brought in for those who get up early and remain patient. Water temperature continues to drop. It’s currently at 45 degrees. Weather looks good early in the week with a chance of rain or snow as we head towards the weekend. The south end of the lake is still recovering from the winds earlier this week. The water is starting to clear and there have been some good reports from the Zippel Bay area. I would expect fishing to be excellent in front of the gaps as the water clarity improves". 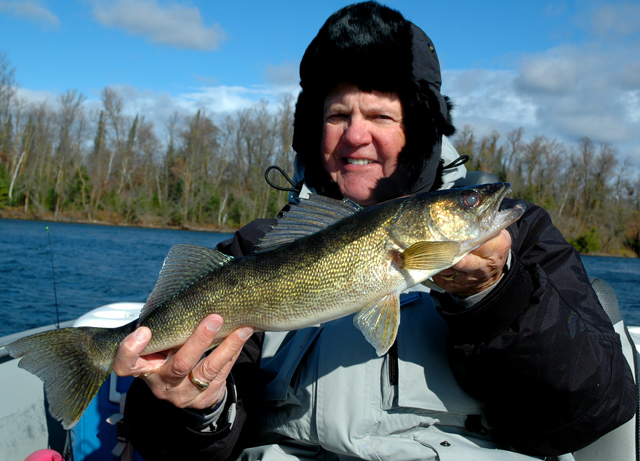 (10/28) On The Rainy River, upstream toward Clementson, Walleye action is getting more consistent. So far, larger fish aren't showing up in numbers, but there are limits of "eater" size fish being caught. Reports are of low water and slow current flow. Water temperatures are hovering around 43 degrees in most areas. 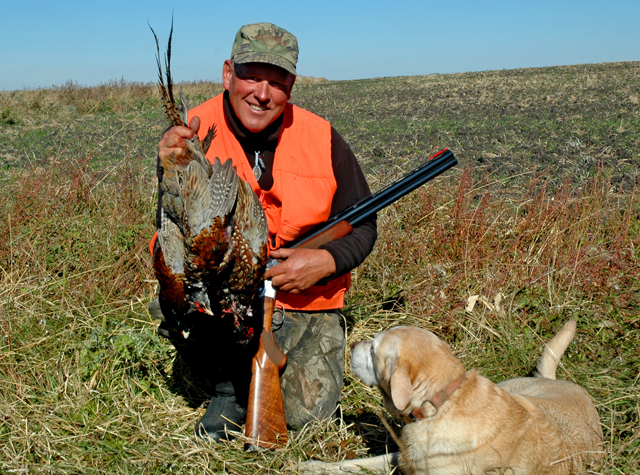 Fishing Report October 27, 2011 Jeff Sundin Just returned home from North Dakota where the Mallards were flying and the Pheasants were too, sort of. The the Pheasants were tricky, but not as hard to come by as we had feared. After a week of snooping around and figuring out a few tricks, we finally got the hang of where to find 'em. There were a lot of folks out there who talked about the wet spring. Flooded fields caused terrible losses to the young pheasants and it seemed like the only areas where populations were still fairly good, were areas near higher ground. Maybe the young birds faired better in these areas or maybe they've been helped by supplemental stocking, but there were birds to be found. Almost all of the farmers are finishing up their crop harvest and most of them have the fields already plowed. More than once, we heard the term "record time" used as folks talked about getting the crops out of the fields. With all of the black dirt instead of crops in the fields, it's going to keep getting harder to find fields to hunt in, but for now, there are still a lot of Mallards feeding in the corn stubble. Our best hunt of the week came about as we walked a half mile through a chisel plowed Corn field near one of the larger lakes. It was a tough walk in, but the Ducks liked that field and it wasn't too hard to bag our Mallards along with one bonus Pintail. Late in the trip, we saw other fields that had large flocks of feeding ducks too and for now, the field hunting is a good idea. It's gonna take me a while to catch up on emails and phone calls this morning, so I'll be dropping in a few comments as I have time throughout the day. Watch for these and some great pictures from the trip too. Fishing Report October 18, 2011 Jeff Sundin Well, Bruce Champion and I toughed it out for another one of our famous late fall trips. We've fished in everything from rain to snow and gale force winds to flat calm water. We know that the weather is usually going to throw us a curve ball, we're used to that. Hey, guess what? We know that it will be worth the struggle, and so it was on Monday, the last scheduled fishing charter of my season. After the past three days of blustery, cold winds, I had actually offered Bruce the no harm, no foul, bail out clause on Sunday evening. Knowing that he could have chosen to stay home and keep warm behind the gorgeous walls of his rustic cabin, he said, Yes, I want to go along! So we made our plans and headed up the trail. Lately, I'd been trying to beat the wind by fishing some of the smaller lakes in Northern Beltrami and Itasca Counties. For Monday, I had it narrowed down to three choices, between Blackduck and Northome. Based on last Friday's performance, I chose Island Lake at Northome. At the landing, surface temperatures had dropped down to the 48 degree mark, slipping 7 degrees from last Friday. The sky was bright and sunny. Once I left the landing and headed out accross the lake, we found that the wind, now reduced from the brutal level, down to only nasty, was still coming out of the Northwest. Whitecaps still covered the surface of most of the lake, but there was clearly a little relief on the horizon. I had high hopes that I could pick up where I'd left off last week, so I headed for the spot where we'd done well last Friday. By now, the Walleyes that had been stacked up along a rock breakline, protected by the island, had moved to points unknown. We poked around the lee side of the island and fished a couple of points where weeds and rocks were mixed. On these spots, we picked up a few slot fish, but no keepers. There were an above average number of Northern Pike, a couple of Smallmouth Bass, and a smattering of Perch too. So there was a little action, but not quite enough to keep us there. Next we moved out into the open water, on the North side of the lake and discovered that by now, the wind had moderated even more. Still blowing hard, still producing whitecaps, but now I could manage the boat, in fact, you could say that boat control was easy now. I decided to try a long, narrow bar where mixed rock and weeds typically hold at least some fish. This time it was better than that. At first, Walleyes were holding tight to the Western tip of the bar, I held position there and within a half hour, we had Bruce's 6 Walleyes safely tucked away in the cooler. We hung out on this bar for the better part of the day and the action was continuous. Throughout the afternoon, the wind continued to diminish and as it did, the main pack of fish slipped slowly Eastward on the bar, favoring a stretch of shallower rocks in about 6 feet of water. I would lose them occasionally, but never for a long time. By 4 PM we'd caught and released a lot of fish, 40 for sure, maybe more like 50, we pulled up stakes from this spot and headed toward the South end of the lake, hoping to land one or two larger size fish. On the South end, there were a few surprises. Apparently all of the wind that's been pounding in to that end of the lake has shaken loose an new food chain. Places that were inhabited before by larger, "slot-size" Walleyes, were now full of hungry Perch and some jig stealing Northern Pike. There was action for sure, we even kept a hndful of the better Perch to add to the larder, but for the most part, Walleyes had moved on from these locations. We did find one rocky point where we picked up 3 or 4 Walleyes and at 6:00 PM, this was a great excuse to declare victory and head for the ramp. Later, in the fish cleaning shack, it was evident that the fish we kept had been feeding heavily throughout the day. The stomachs of most fish were packed tight with minnows that they'd eaten. Presentation everywhere we fished was the 1/8 ounce jig and minnow combination. During the windiest part of the morning, we had 1/4 ounce jigs, but unless the wind is really blowing, these are too heavy for use on the shallow rocks and get snagged too easily. The minnows were a hodge-podge of everything from crappie minnows to Spottails and I can't say that one worked better than another. We used 'em all and they all worked. Well, there ya go! Unless we get a stretch of great weather and the phone starts to ring, my official 2011 season has reached it's end. Don't worry though, there are lots of reports on their way as the fall unfolds. For me, it won't hurt to take a little time, do some hunting, heal a few wounds and get some rest. Beginning on Wednesday, I'm going to be off the grid for about a week and unless I find a new Wi-Fi connection that I don't yet know about, the next report will come in on the 27th of October. I'll have the laptop just in case, but don't be surprised if nothing new shows up. Fishing Report October 17, 2011 Jeff Sundin One day I looked up at the clock and it was the fishing opener. It seems like about twelve days later, I looked up at the clock and it was the 17th of October, you're kidding right? No way, this can't be my last fishing trip of the season, is it really? Geeeezio! On Sunday, we did our best, we tried to stay out on the lake long enough to get into a little action, but the cold, blustery wind interrupted the plans. 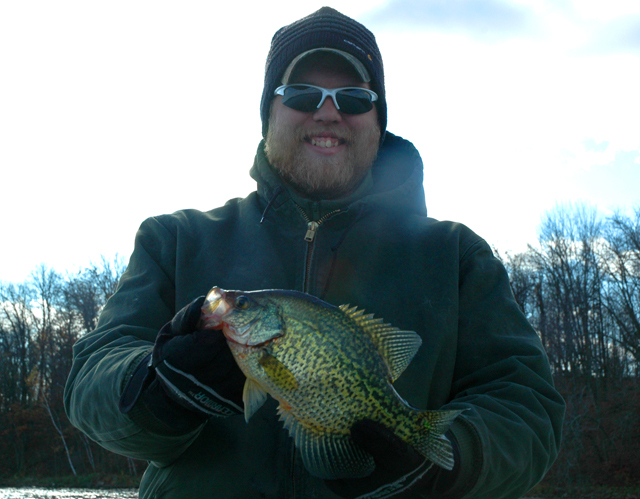 Crappies were easy to locate, 32 feet of water along the steepest breaklines. They were in small packs, very easy to see on the Humminbird. Holding the boat was a little tricky though and before we ever really got rolling, the blustery Northwest wind got the best of us. We managed to gather up a few fish to send home with "the kids", came home and settled for a nice fried Chicken instead. You know what? That was pretty darn good too! Today I'm wrapping up the season with Bruce Champion, a long time customer and great friend! On Tuesday, I'll let you know how it goes and after that ...... I'm heading for the Corn and Cattails of Southeastern North Dakota. Fishing Report October 16, 2011 Jeff Sundin Lunker Walleyes did their best to cooperate, but brutal Northwest winds and a good old fashioned case of the fish winning their battles, left us hungry for a re-match on Saturday! We did our best, we toughed it out when the wind was at it's worst, we struggled with slow fishing on the calm side of the lake and we held our ground until well after dark. We put the right bait in front of the right fish, got 'em to bite, got 'em hooked and reeled 'em .... well, almost all the way to to the boat, but not quite. It was one of those days on Trout Lake in Coleraine, where almost every fall, Bob and Mike Carlson wrap up their fishing season with me. Mike loves that lake and he loves the idea of catching a lunker. Bob and I love Mike and want to make that dream come true for him. Most times it works out great, but today, we lost most of the fish we hooked. Maybe it was cold hands, maybe it just wasn't the right day for us to win. Either way, the fish were there and we did get some, it's just that we know we've done better and will do better again! When we arrived, the surface temperature was 55 degrees and there were strong, gusty Northwest Winds. Combined with an air temperature of about 38 degrees, it wasn't any too warm. Luckily, there was some sunshine and the air temperatures were rising. We tried fishing one spot on the windy side of the lake. We knew that there were fish on that spot, I could see them on on the graph and Mike had a nice one hooked up. The area was just un-fishable, at least for the time being so we made a move. When I moved to the calm side, I just couldn't find any fish there were active. On the weed edges, I marked several schools of fish in a variety of places, but these fish must have been on vacation, in calm water, there wasn't much happening. I moved toward the North end of the lake where I could get into the wind a little, but not out into the main lake where we'd feel the full thrust. Still breezy, but now it was at least manageable. What we did here that worked, was to fish the deep edges of the shoreline breaks wherever there was an underwater point. Early in the day, we used jig and minnow combinations and Lindy Rigs tipped with Night Crawlers. The jig and minnow was performing above average today and early in the trip, Mike hooked a nice one that got off just at the last second. For me, the Lindy Rig and Crawler was working, but it was getting me Smallmouth Bass instead of Walleyes. Later in the day, the wind let up a little and the temperature rose just enough to let us get back onto the windy side of the lake. By now, fish started showing up more frequently on the screen of my Humminbird and I switched to a Lindy Rig tipped with a Large Creek Chub. This was a good idea because the bait got picked up by a 23 incher within about two minutes of dropping it in. Mike picked up a couple of eaters and a 20 incher on the jig and minnow, but soon switched to the rig too. As evening approached, we knew that there would be some action at "Glory Hole #1" so we all got rigged up and in position. The spot is a deep rock point that drops into 100 feet of water. The Walleyes follow the point starting at about 40 feet and work their way onto a shallow flat of mixed rock and weeds. By 6:00 PM they were there and they were biting. Mike hooked up a nice one, got it almost to the boat, it got off. I caught another 20 incher and then Bob hooked a nice one, got it almost to the net, it got off. The rest of the evening went that way .... several more hooks ups, several more losses. We all left the lake in good cheer, thankful for the chances we had and happy to know that the fish are still there. You know, I have a notion that next time, the pedulum will swing our way instead! It just happens that way sometimes. Finally, with another big time wind predicted for today, I'm not sure how I'll approach things. It's a fun day for me, so I might just do something a little easier than I've been doing. On the other hand, I do have a few eager eyes looking at me, wondering how I'm going to keep them entertained. Hmmm.... we'll see. Fishing Report October 15, 2011 Jeff Sundin Northwest winds at 30 MPH, 44 degrees and Walleyes on the prowl! Friday wasn't exactly the kind of day people hope for when they plan a fishing trip, but for 2011, there have been more good fishing days when the weather stinks, than when the weather has been nice. So it was on Friday as the cold wind ripped through the bare branches of the trees and allowed the whitecaps to form, even on the calm side of the lake. The Walleyes did not care though, the turbulent water just made them hungry and it allowed us to make quick work of our fishing day. When we arrived at the lake, the surface temperature had dropped from 57 to 55 degrees over night. There were whitecaps rolling accross the surface on the calm side and as we headed for the rocks that I'd fished on Thursday, we got a glimpse of what looked like three to four foot rollers on the windy side. As soon as everyone was baited up, I pulled onto a stretch of the shoreline break that runs adjacent to a fairly large rock flat. The breakline runs from about 8 feet down to 16 feet and on the rock flat, there are some shallow isolated boulders that lay on top of smaller rock and gravel stretchs. Within a few minutes of tossing our baits into the water, Carl had a fish on, a nice keeper size Walleye. Soon after that, Mike had one too then another for Carl, then a bonus Smallmouth for Mike. It was a great first effort, but the wind had already put a chill into everyone and I needed to take a quick break on the lee side of a steep hill on the island. After a brief warm up, we took a chance on trying this short stretch of calm water and had a little fun with some Smallmouth Bass and a couple of Northern Pike that liked the weedline, but we didn't find any more Walleyes here. So, back into the waves we went, hoping to pick up where we left off. This time, the fish had moved a little deeper, but they were still catchable. The problem was that the wind had picked up even more and in spite of the fact that we were catching fish, Carl twisted my arm until I finally gave in and brought them back to shore. By the time we wrapped it up, there were 7 nice keepers in the cooler and we had released another half dozen larger Walleyes and a bunch of Smallmouth Bass. It was cold for sure, but definitely worth the effort. So since I was there anyway, ... and they had their own wheels to drive home, ... and I already had been given orders from headquaters to catch some fish, ... I decided to head back out on my own and see if I could get some of my own fish. I got back out on the lake at 2:30 and I had allowed myself until 4:00 PM to see what I could do. Guess what? Even without help, I managed to catch some more Walleyes, in fact, by 3:30 I was smashing through the waves, headed back toward the landing with my limit. Hey, now we just need to cook 'em up! The presentation is just what you expect, we used 1/4 ounce jigs in the heavy water, 1/8 ounce where is was calmer. The minnows I've been getting are all mixed up, some shiners, some fatheads and even a few mystery minnows. They all seem to work, so unless I was heading for Leech Lake, where I really do like Shiners the best, I think almost any minnow of the correct size, would be fine. Jig and minnow combinations are really all you need right now and unless you're going after a lunker, a bucket of minnows and a hand full of jigs is about all you'll need for the rest of the season. If you are after a lunker, like we will be today, then Lindy Rigs with big Redtails, Creek Chubs or Sucker Minnows is a better idea during the daytime. After dark, trolling the shallow breaklines with crankbaits is the clear winner! By the way, the night bite is hot and heavy in a variety of lakes right now! For today, we're going to let the morning cold burn off and start at 10:00 AM and we're planning to fish into the dark this evening. Our goal is to bag a ten pounder, so I'm going to pack up the big minnows and get the flashlight ready. I hope to have some good pictures tomorrow, time will tell. Fishing Report October 14, 2011 Jeff Sundin Northwest winds ushered in a more October-like fishing pattern on Thursday. It's been a while since we've had a shake up in the system and at least for one day, this was just what the doctor ordered. My last day on the trail with David Chrz for this year. Today, I could go anywhere, do anything and generally make my own rules. I was in the mood for one really good shot at the Walleyes before he left, so we took a little road trip to one of the lakes that's off the beaten path, but has served us well a few times this fall. Before I go on, I could use a little help. Somehow, somewhere, David's Camo boat bag got seperated from my boat. Like my landing net last week, the mysterious disappearance has us befuddled. I for one, would really like to see the bag and it's contents returned to him and it would mean a lot to us if you'd all keep your eyes peeled and your ears to the ground for any clues. To many, the bag and it's contents just looks like a collection of fishing stuff, some good some not so good. But there are a few things in that bag with sentimental value, things that were given to him by someone that he won't ever see again! Please, if you hear anything, let me know. Okay, when we got to the lake, water temperature had fallen in the 56 degree range, there was already a stiff chop on the surface and the sky was threatening rain. As the morning unfolded, rain did arrive, but luckily the outside air temperature stayed warm enough that it wasn't too miserable out there. With a good drifting wind, I headed for the rocks right away. On a calm day, I'd have first looked for weeds, but the chop gets the fish moving and when they do, somehow the rocky spots always get fired up. On our first drift, we only picked up a couple of fish, but the Humminbird showed more, scattered fish on the break from 8 to 10 feet of water. On the next drift, we picked up a couple more, marked the spot and got dialed in to a shorter drift pattern. From then on, we caught a dozen or more fish, mostly larger ones that we released, but a few keepers too. We tried a couple of more spots, picked away at a few more fish, but with the whitecaps getting bigger and the rain getting more persistent, I headed behind the island. By the way, everyone loves fishing by the island! It was a perfect setup, about halfay protected from the wind, but there was still enough breeze curling around to give us a good drift. The rocks here were holding fish too, this time a larger school of smaller fish. We managed to stay in steady action for most of the afternoon in this area and by the time we left, we'd gotten a good workout. I used the drift sock and outboard to control the boat speed and kept it at about .7 to .8 MPH. At that speed, 1/8 ounce jigs tipped with minnows was perfect for the 8 to 12 foot breakline. I marked some fish deeper too, and comparing notes later with a friend, learned that those deeper fish were Perch. They had caught a dozen or so nice Jumbos in about 16 feet of water over a softer bottom. Today, Catch 'em and get outta there! Hurry up and relax so we can get home! My pal Carl and his fishing pal from Florida, are in the hurry up offense today. I'll high-tail it back to my spot from yesterday and hope the fish remember me. 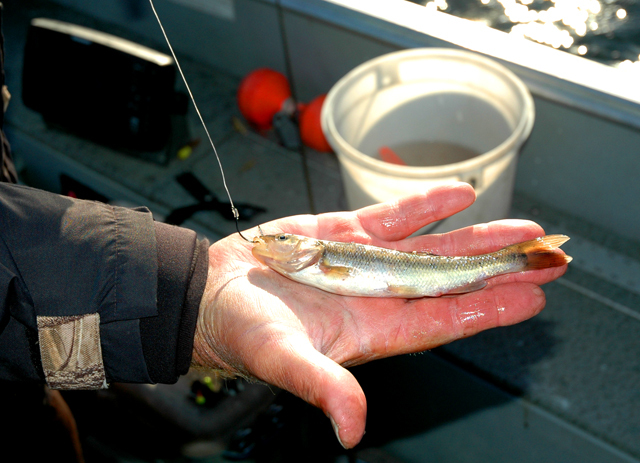 (10/14) On Lake Winnie and Cutfoot Sioux, There are some fish starting to build up on Lake Winnie's North Shore. The rock pile, little rock pile and Stony point have re-bounded. With lots of wind, you'll find fish on the rocks, when it calms down, deeper breaklines and the remaining areas with healthy weed cover will produce fish. It's getting harder to find shallow weeds, but you can still locate decent weed patches in the 9 to 12 foot range. Walleye fishing after dark continues to be reliable on the big lake. Trolling crankbaits like the #5 Shadlings in 5 to 7 feet of water is currently producing numbers of fish. Cutfoot Sioux hasn't got much of a daytime Walleye bite going on, but the Jumbo Perch continue to take up the slack. With winds swinging back around to the North, some of the better Crappie areas will be calm again and I'd guess that the fish will re-group soon. If you're on Cutfoot, the Walleyes are running during the evening and again later, after dark. The evening bite has been reliable and you'll find them on a variety of the more popular spots. A good idea is to look for fish during the day and pick out one or two favorites and then return when the timing is good. Watch the deeper breaklines too, there are a ton of fish in the 22 to 28 foot range and if you're feeling like doing some Lindy Rigging, a large Creek Chub or Redtail would be a good way to hook up with a big fish for all of you catch, photo and release anglers. (10/14) Grand Rapids Area Guide and NMLOG Member Sean Colter reports; " The night bite on Leech Lake has been good. Fishing inside the weed edges at 5 to 8 feet, trolling crankaits has produced lots of larger, slot fish. It's rare to get a "keeper" fishing this pattern but if you want to get pictures of some nice fish, this might be for you! (10/14) From Wired2Fish, The Mobile version loads the most current fishing stories, fishing videos, radio programs and fishing tackle reviews first. Then from there you can choose one of several buttons to visit archived articles, video, radio, tackle box, blog and more. Learn More Here. Fishing Report October 13, 2011 Jeff Sundin Roller coaster weather forces us back into our rainsuits for Wednesday and even the fish acted like they're tired of this junk! I have to apologize for the short report this morning, but crazy at it sounds, I've got a small wrist injury that's holding me back a little bit this morning. I'll get caught up with a major update for all of the weekend warriors on Friday morning. Our fishing trip on Wednesday took us to Pokegama Lake in Grand Rapids, where the surface temperatures are holding steady at 57 degrees. Grey, drizzly skies and a light wind persisted throughout the day. Apparently, we were the only living creatures on the lake for most of the day. It wasn't until mid afternoon that we saw another boat. Our fishing wasn't what I'd hoped for, not that we didn't have moments of glory, but we worked hard at getting our bites and I may have set a new record for how many fish I could see on the screen of my Humminbird before we got a strike. It's really frustrating when you can see fish for hours at a time and not being able to figure out a way to get them to strike. Luckily, there was just enough action to keep us thinking about the next bite and in the end, we managed a half dozen decent Pike, a few nice Walleyes and another half dozen Smallmouth Bass. Hey, it's also really frustrating when you want to show your favorite people a great time, but something holds you back. I think I could write a book about that! Our main presentation was Lindy Rigs tipped with large Creek Chubs. This is a pattern that's worked well all season long and it worked today too, our big problem was the inactivity of the fish. We'd feed them piles of line, sometimes all of the line on the entire spool, but we'd still lose the fish because they hadn't swallowed the bait. If the fish were even a tiny bit more aggressive, the pattern would still be working great. We know that some of our minnows were attacked by Walleyes, but all of the Walleye we caught were on a secondary presentation, Lindy Rigs tipped with air injected night crawlers. Jig and minnow combinations accounted for a few fish too, but rigging was still the best answer. The best fishing depth was 31 feet and finding fish in that depth range was easy. If you fish a stretch of water and don't mark fish, then they aren't there. (10/13) Bemidji Lakes Area and NMLOG Member, Paul A. Nelson says; The fall cool down is on again as more seasonable temperatures reach the Bemidji area. Some anglers had trouble locating walleyes this past week because the fish moved shallower with the warmer weather. 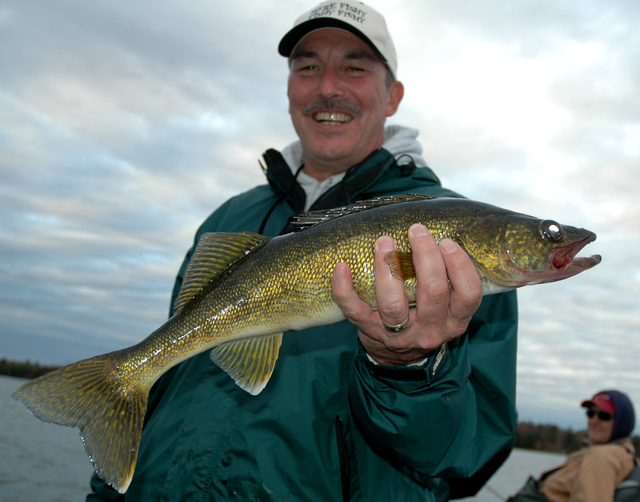 Once anglers were able to locate some walleyes, the fish were usually in a biting mood. The full moon this past week shifted some of the walleye action to the evenings and after dark. Anglers who haven’t fished at night for walleyes are really missing something. The walleyes can be very active and will crush crankbaits and minnow baits trolled over the chara and rock flats in 8-14 feet of water. 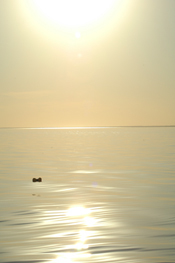 Walleyes feed towards the surface after dark, so they can see the baits silhouetted against the moonlight. Anglers should use larger baits at night, to give walleyes a better target in the limited light. The night bite for walleyes is usually good at least 3 days before and 3 days after the full moon. Clear nights with little wind are usually the best for catching walleyes after dark. Once the fall cool down resumes, the bite should improve for most species of fish, with all species are trying to put on some weight before winter arrives. High winds this past week knocked down many of the leaves off the trees, so visibility in the woods is much better now. This should give hunters better shooting lanes for grouse and archery deer hunting. Visitors can make it a woods and water weekend in the Bemidji area, with good fishing during the day and many opportunities to hunt public lands for grouse and deer when anglers are not on the water. Goose and duck hunters can also have good hunting in the mornings and evenings and leave some time during the day to go out and catch some fish. Most fishing guides have openings at this time of the year, so bring the hunting gear and fish for a half day with a guide, so there is no need to haul a boat. Fishing Report October 12, 2011 Jeff Sundin Sandwiched in between some rain and mixed up weather, Tuesday was a welcome return to more typical fall conditions. 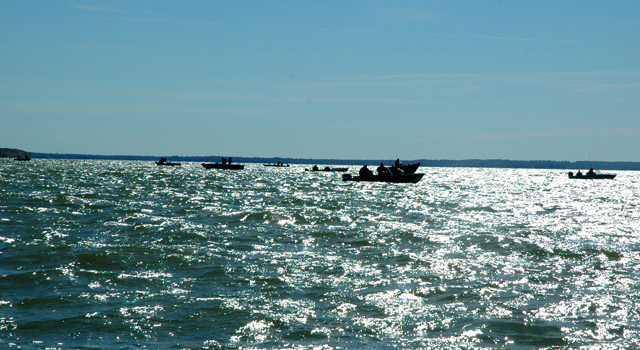 Sunshine, manageable breeze and steady fishing action for Leech Lake anglers. When we arrived at the Federal Dam landing on Leech Lake, there were a half dozen rigs in the lot and the campground looked mostly empty, not shut down yet, but evidence that the end of the fall season is drawing near. Once we made our way out the channel and onto the main lake, we found clear water, a light chop and bright, sunny skies. The surface temperature is hold steady at 57 degrees and was fairly consistent everywhere we went on the lake. Mixed bag fishing was on the agenda and whatever bit first was going to be the target, at least for the morning. Our first stop was the main breakline on the East side of Portage Bay. I stopped the boat in 12 feet of water, backed the stern into the shallow side at about ten feet and we started fishing with jigs and shiners on the drop off. Within about the first 50 yards, Eldon Skoglund, AKA "The Norwegian Hammer" delivered bad news to the family of a solid 11 inch Perch. Soon there was another, then another. Guess what? We're Perch fishing now. Action was steady, but not fast, after a couple of hours, we had boated a couple of dozen Jumbos and if we'd stuck it out longer, I think we could have kept catching throughout the day. Our presentation was drifting with the wind and then back trolling on the return trip, we fished a stretch of water about 200 yards long and the Perch were scattered all along the breakline and even out onto the flat, in the low grass and mixed weeds. We used mainly 1/8 ounce jigs, but at times, experimented with heavier, 1/4 ounce too. Either worked , so suit your style and match the weight to the wind speed, you should be ready for action. We had a mixture of Shiners, Rainbows and Fatheads. It didn't see to make much difference to the Perch. Northern Pike were in the neighborhood too. We caught a handful of smaller fish and got our jigs snipped off a half dozen times as well. There wasn't much evidence of any large ones, but rigging for larger fish may have revealed some better ones in the area. Our next stop was across the bay, on the weed flats. When I stopped the boat in 13 feet of water, the Humminbird was showing lots of fish scattered across the flat. Some were in weeds, some were on open, clear stretches and some were suspended two or three feet above the bottom. We cast in the jigs, started a slow drift and moved about a hundred yards before the first strike. In one of the most masterful demonstrations of fishing skill I've ever witnessed, David Chrz jigged up a strike, nursed the fish as it chewed on the minnow and then lowered the boom on a portly 26 inch Walleye! After that, we caught a couple of more Walleyes, a couple of Northern Pike and a few more Perch. The Walleyes we caught here were over-sized, in the protected slot range and we decided to make a bigger move, hoping to find some "keepers" to round out the bag for the day. We headed South with the idea of working our way back from Bear Island, but as we traveled, the wind begin to pick up and by the time I got to Five Mile Point, there was a stiff chop on the surface. I scanned a few stretches of shoreline and settled in just North of Sugar Point. As it turned out, we never needed to leave that area for the rest of the afternoon. Walleyes were cruising the breakline in about 9 feet of water. I marked fish as deep as 12 feet, but these fish were sluggish and didn't bite well. The fish in the 8 to 10 foot range seemed a lot more aggressive, so I used that as the guideline for our drifting patterns. We caught our fish using a 1/8 ounce jig head tipped with Shiners and jigged steadily over the rocks. Today, the fish we caught in this area were mainly in the slot, so we weren't keeping too many. That was fine for us, but if you're looking for "eaters", a little experimentation could be in order. We wanted to be back out front of Federal Dam before sunset so we wouldn't have to travel the river after dark. I wish I would have returned sooner, because when we stopped at "one last spot", a stretch of gravel in six feet of water, the Walleye action was hot, at least for one brief spurt. Within ten or fifteen minutes, we boated 3 fish and missed several more. For all I know, we could have fished here earlier and done well, but I know for sure that I'd check this shallow area right away this morning if I was going to be back over there. Finally, there was more evidence of the evening and night bite patterns on both Leech Lake and Lake Winnie today. As we were fishing that one last spot, there were two boats trolling the shallow flats with crankbaits. On of them boated three Walleyes that we saw ourselves, the other was too far away, but I saw them stop a couple of times, indicating that they might have been in some action too! After we headed into the landing, there were a couple of more rigs just putting in, more indications that the night action is reliable. 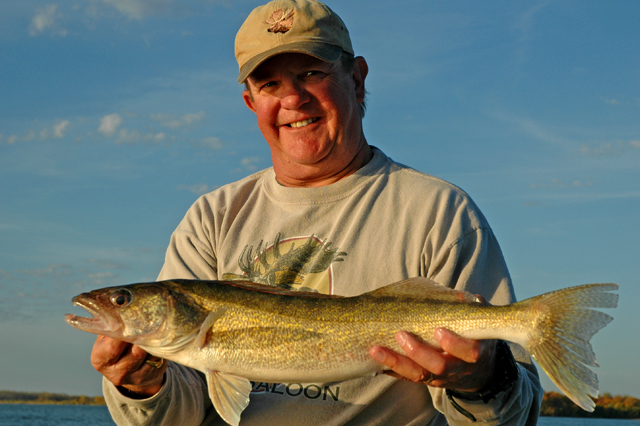 (10/12) On Lake Winnie and Cutfoot Sioux, Walleye fishing after dark has been reliable, especially on the big lake. Trolling crankbaits like the #5 Shadlings in 5 to 7 feet of water is currently producing numbers of fish. I talked with a friend last night who gave me the thumbs up on my observation that there was an evening bite in Cutfoot Sioux. After a slow day on a smaller lake up North, he and his crew headed back down to Cutfoot and set up shop very near the area we fished on Monday. He said that the action was good at sundown, they caught a lot of Walleyes fishing the weed edges in 8 to 10 feet of water and he said that the screen of his Humminbird indicated a lot of fish in the neighborhood. Before we head out today, I'm going to take a deep breath of the good air and hope to re-live some memories from earlier this summer. We're gonna make a torip over to Pokegama and make a move on some larger Pike. With some luck, maybe CPR a big Walleye or two at the same time. With limits of Walleye and a healthy batch of Perch already wrapped up, today is something of a play day and if the weather isn't too bad, I may even have a little surprise up my sleeve. We'll let you know tomorrow. Fishing Report October 11, 2011 Jeff Sundin On Monday, I re-learned an old trick that might help you put a few more fish in the boat before the snow flies. Remember the evening bite. It's been an odd year to fugure out what makes the fish tick, but our fishing experience on Monday reminded me about some of the observations about post-turnover fishing. In past years, I've included several late fall reports about the Walleyes propensity for becoming morning-evening feeders during cold water periods. There's always a point in the fall where Walleyes metabolism slows down enough so that they can get by without feeding as often as they need do during the warm water months. That doesn't mean that you can only catch them early and lake in the day. But it does mean that if you're not catching them during the day, waiting for the twilight bite might be the way to tip the scales back in your favor. On Monday, we did a lot of fishing during the daytime and it was a pretty tough grind. We caught fish, a lot of different fish; we caught Crappie, Perch, Northern Pike, Rock Bass, Walleye and some other odds and ends too. But everywhere we went and whatever we caught, they were always the smallest examples of what each species has to offer. Catching Crappies is great fun, but not if they're 6 inchers, Northern Pike are wonderful, but not 15 inchers and who wants a 10 inch Walleye? Anyway, it went on this way for most of the day. Little stuff, then more little stuff and then little stuff in the rain and then little stuff in the rain and wind! Finally, at about 4:00 PM, things started shifting, we found a school of Perch and this time they were nice ones. Good size, good action, great to eat! As the sun got low in the sky, we decided to take one more swing at the Walleyes, guess what? This time it was easy, we just started drifting along the edges of "old-reliable", then we'd get a bite and set the hook, nothing to it. Nothing changed except the time of day. Same water, same lures, same baits. The only difference was that now we were fishing the twighlight and that was apparently when the fish wanted to feed. I promise to expand on the theme for the rest of this week, but right now, I have a tight deadline on another writing project. In the meantime, check out this link to reports from the archives and you'll pick up on the theme every fall. Today, we're gonna try and put the finishing touches on a few Walleyes and then make it back into mixed bag territory to try the Crappies again. Check in tomorrow to see how we do. Another busy Multi-Tasking day lies ahead, but I made time to give you a special treat, here's a higher resolution Rainbow Picture. Fishing Report October 10, 2011 Jeff Sundin On Sunday, the weather settled into a late, September-like pattern. Grey skies, drizzle and a humid, chilly breeze. Our destination was Blackduck Lake in Beltrami County. The 2600 acre lake had been a good "fall lake" for me in the past and since I hadn't been there since July, it was fresh territory too. When we arrived, the surface temperature was just over 57 degrees and there was a slight ripple, but the surface was mostly calm. Within an hour or so, there was enough breeze to drift the boat and on a scale of 1 to 10, I'd say that fishing conditions were at 8 or higher. I scanned a few of the open water bars and humps near shore, but the Humminbird wasn't revealling much activitiy on any of the open water, hard bottom reefs. There was a variety of suspended fish, bait and other small marine life over the open, deep-water flats, but nothing that really got my attention. Next I headed for the weedline and started fishing in 8 to 10 feet of water, concentrating on points and pockets in the weedline. Right off the bat, we picked up a couple of "eaters" on the first spot, but when I attempted to get really dialed in, the bite fizzled out. This turned out to be the pattern for most of the day, find 'em, catch a few and then move. In fact, it reminded me of the pattern on Saturday after the big wind storm, Walleyes we fairly active, they were just scattered all over the lake. It was no different on Blackduck, except for a couple of spots that were either above or below average, every place we fished had at least a little life on it. There were a couple of things to watch for; shoreline points and inside corners along the Bulrushes held more fish than did the weedbeds located out in open water, away from shore. Areas where the weeds appeared to be green and healthy, held more fish. If the weeds appeared dead, soft and Brown, were much less likely to hold fish, except for the odd straggler. Inside corners or pokets where deeper water tucked into the shoreline had better fish than the points, at least on this day. Fish could be more active on any given day and make the short move to points, so be sure to check both at each spot you try. Our presentation was strictly jig and minnow in 8 to 12 feet of water. On most of the spots, 8 feet was the key depth, occasionally deeper or shallower. We had a really brief chat with another angler who was trolling crankbaits along many of the same shoreline areas we fished and he reported having some success with that presentaion too. When I found fish in the pockets, it was fun to hold the boat stationary and pitch our jigs toward the weeds. Work the jig back toward the boat, hopping and jumping it as you retrieve it. 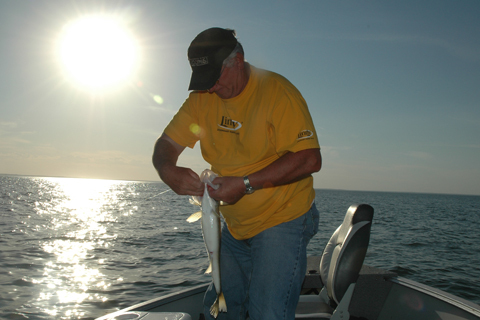 Overall, the fishing was good, we kept 10 Walleyes ranging from 14 inches up to 17 inches. Today, we never caught a fish over 17 inches, but that's Blacduck for ya! Tomorrow, they may all be over 17 and on the same spots. There were a ton of small Northern Pike on the prowl too, some of them would have been good eating size fish, but we have another idea for Pike coming up later in the week and we're saving ourselves for that! Finally, I really miss my Beckman Net! The best landing net I've ever had, either blew out of the boat on the highway, or heaven forbid .... disappeared while I was at the bait shop or Gas station. Guess what, if you have it, you can keep it, yup it's yours. But I wouldn't mind knowing that it was being put to good use instead of being flattened by a Semi-Truck! If you know the whereabouts, let me in on the secret. (10/10) On Leech Lake, Walleye reports were good again over the weekend and as I reported last week. The fish are moving in and out of the rocky, shoreline areas as the wind blows. The easiest way to pick an area to fish? Use the rule of thumb, wind blowing in = good! Jig and minnow combinations in 7 to 12 feet of water, depths depend on the amount of wind. Heavier winds tend to get fish active and they'll move shallower, lighter winds, watch the breaklines in slighty deeper water. (10/10) On Lake Winnie and Cutfoot Sioux, Walleye fishing really picked up on the big lake according to Sean Colter, NMLOG Member and Grand Rapids are fishing guide. Sean said that the Walleyes were on a hot bite on the East side of the lake on Sunday as the Grey slies and breezy conditions combined to encourage Walleyes to go on the prowl. More good reports came in from the South shore too. Areas from Little Stony Point, all the way East into Musky Bay were producing numbers of fish throughout the weekend. Fishing Report October 9, 2011 Jeff Sundin On Saturday, calmer seas helped make fishing conditions a lot more pleasant on Northern Minnesota lakes. In the aftermath of our two day wind, lightning and thunder storms, fish were left scattered, but catchable. Walleyes or die! That was the mission on Saturday and I'd hopeed that we could pull that off on the same lake that I fished a couple of days ago. I'd rather that the storms hadn't blown through over night, but luckily, in spite of the dampening influence of the weather change, the fish were still sort of hungry and we managed to do a pretty fair job, considering. When we arrived at the lake, water temperatures were between 57 and 58 degrees, the wind was about 5 to 10 from the Southwest and there was just enough chop on the surface to drift us along the breakline. I started doing a milk run of the same spots that I'd fished on Thursday and found that there were at least some fish in most of the same areas, but this time was different. The Walleyes were located near the same areas where we found them on Thursday, but now they were tucked into the weeds instead of roaming around on the rocks. Almost every time we stopped, the best action would come within 5 or 10 minutes, followed by a severe slow down. In the aftermath of our heavy winds and thunder storms, the fish were scattered and the only good way to catch them was to keep jumping from spot to spot, picking off the active fish as we first arrived. The best locations were weed patches adjacent to rock and gravel stretches. The best fishing depth turned out to be 9 to 11 feet, but there were places where I marked fish in the 18 to 24 foot range as well. Presentation was 1/8 ounce jigs tipped with Shiner Minnows, hopped along the weed edges. Fish were active enough to bite, but without nursing the fish along, many of the bites were missed. To do the best job of catching these finicky fish, I think it's best to "tow them along", just hold on, keep light but even pressure on the fish as they chew their way from the minnow's tail, toward the hook. When the sensation becomes one of steady pressure, without the feeling of chewing or striking at the bait, the fish has finally inhaled the entire bait and it's time to set the hook. Not too hard, just load the rod tip, and sweep the hook set. Today, there's no telling where I'll wind up. For the next 5 days, I'm fishing with a customer who has also become a really great friend, we could be fishing anywhere from Lake Superior to Table Rock and all points in between! I know one thing, we won't be doing too much of the same old thing and I'm looking forward to reporting some new and interesting ideas over the next week. Fishing Report October 8, 2011 Jeff Sundin When I look back on the 2011 fishing season, I'm going to remember it as a season of extremes. I've had some of the most wonderful and fantastic moments of my life this season, but I've also had some really humiliating experiences. The weather has had a lot to do with it, it's dished out a lot of challenges for folks to deal with this year. Friday's wind, was one of Mother Nature's best efforts to discourage me, but luckily, I don't get discouraged that easy and we found something to do anyway! So there! Our original game plan was to try and catch some Crappies first, but it didn't matter if we'd need to switch gears. The boys were up for anything from Perch to Muskies and after I scratched my head for a while, I decided that the best place to go would be a lake where I'd have some fall back options. Good old reliable Cutfoot Sioux made the most sense, here we could fish for anything and everything. When we arrived at the lake, the wind was already blowing so hard that it was hard to keep our hats on. From now until the days end, we'd be 100% hunkered down, heads into the wind and working for every bite. Justin said it best when he noted "at least it's a warm wind", and it was. The un-seasonably warm temperatures were a real blessing because normal October temperatures combined with this wind might have been enough to make us cry uncle, maybe. Trying for Crappies first, I headed for the calmest water I could think of. I didn't have a lot of choices about where to fish because the South wind seemed to be heading straight into every good Crappie spot I knew about. Once we settled on a spot and found a school of fish, I dropped in a marker and we let our jigs drop in to the water. Chris caught a really nice, 13 incher and there were plenty more showing on the Humminbird, but the wind was blowing so hard that every time I let my hand off the tiller, we would lose 50 yards from our position. We soon figured out that holding a position to try and catch either Crappies or Sunfish was just going to be too complicated. We re-grouped and had a meeting of the fishing committee, and then moved on to option three, Jumbo Perch. Now these gorgeous, lovely, sweet, beautiful and delicious little creatures having been saving my hide on crummy weather days for over two weeks. I can't begin to tell you how happy I am about that! One more time, Perch to the rescue as the fiesty Jumbos seemed to be waiting for me at every stop. Some fish were better than others and yes, we had to catch a ton in order to sort out what we called keepers, only the fish over 10 inches. But we had all day and with at least some fish biting at every stop, it was actually a great way to keep our minds off of the weather. The secret was to fish on shallow weedy flats where there were clear, open gravel spots in the midst of cabbage or other mixed weeds. We located fish by what river fishermen know as "slipping". By using the Drift Control Wind Sock and pointing the transom into the wind, I control our drift speed with the outboard. The idea is to actually lose a little ground, so it's like drifting, except a lot slower. Once anyone caught a nice size fish, I'd drop in a marker and then use the outboard to hover on that position. The system works like a charm, especially on really windy days. The key depths were 4 to 6 feet, so keeping the boat under control, we were able to fish with only an 1/8 ounce jig head tipped with fatheads. Presentation, just drop the jig to the bottom, hold it about six inches above the gravel and try not to do anything. The Perch don't need to see a lot of action on the jig and with the waves, the boat is already putting plenty of action on the bait for you. We kept it up all day, moving from on weed flat to another. Every spot we tried held at least some fish. The number of fish and the size varried, but that's part of the fun. Catching a couple of hundred Perch and sorting them down to the best 60, well, it was kind of fun. For today, back to the Walleye and it sounds like the winds will calm somewhat. I hope to re-live the experience we had on Thursday and I'll let you know tomorrow if it works out. Fishing Report October 7, 2011 Jeff Sundin Wind?... check, Walleyes?... check, Panfish?... on the agenda. Thursday marked the return of monster wind to Northern Minnesota and I've made up my mind, if the choice is too much wind vs. no wind at all, I'm going with too much! For the second annual fishing trip with Chris and Justin, I have two days to come up with cool stuff to do. On Thursday, Walleyes were on the agenda and I had planned a return trip to a lake I'd fished a couple of weeks ago. Thanks to the windy conditions, Walleyes were on the prowl and they were completely cooperative. When we arrived at the lake, Surface temperatures were 59 degrees, there was a bright, sunny sky and the lake was already churning, some areas exposed to the South wind, already had a nice "Walleye Chop" on the surface. I'd heard from a pal that they'd caught some Walleyes in the weeds and my first stop was to check out a Cabbage bed that he had mentioned. It didn't take too long to pick up the first Walleye, then a second, but the Humminbird and the fishing rods agreed that there were fewer fish than we were hoping for. Next stop, another weed bed, another couple of fish, but still not what we were after. Next, I headed for a shallow rock flat that had a better breeze blowing accross it. Things started getting a little more interesting here. We picked up a couple of keepers, a couple over-sized fish that we released and a couple of Bass. The action wasn't furious, but it was steady. Now I had the idea that maybe rocks were better than weeds, so I started looking for more rock spots. Another shallow flat, covered with rocks and fully exposed to the increasingly heavy wind and whitecaps turned out to be full of fish. There were Walleyes cruising the outer edges of the rocks and Smallmouth Bass milling around on top. The action was good and remained steady for over an hour, but by now, we'd had enough of the wind and one of the crew needed a calmer place to fish, where he could concentrate a little better. Against my better judgement, I headed for the calm side of the lake, hoping that another shallow rock spot would have a few fish on it. Luckily, there was just enough wind to keep the water moving, but the surface was a lot quieter than the previous spot. Guess what? I stumbled into the mother lode! The small rocky flat was loaded and within an hour, we'd easily caught over 20 fish. Presentation was an 1/8 ounce jig head tipped with a minnow, any minnow. We started our day with Shiners, but had used every single minnow by late afternoon. I had a bag of Crappie minnows in reserve and we started using those with at least equal reults. In fact, if anything, the small minnows made it even easier to set the hook. Every good spot had the same features, shallow rocks in 6 to 8 feet of water with access to a nearby weedbed. My guess is that the fish retreat to the weeds when it's calm and roam the rocks under breezier conditions. I'll drive to pick up the boys again and then we'll head for whatever seems right for today. We'll be on the mixed bag plan, so really anything that bites will keep us happy, but we'll have a special place in our hearts for some Crappies if the weather allows. Fishing Report October 6, 2011 Jeff Sundin More warm temperatures made getting outside more tempting than ever! Lots of traffic on area lakes as folks take advantage of the gift. A shortened day for me was an opportunity to catch up on some of the domestic chores around home in the morning. There's a lot I don't know, but one thing I do know, my Chickens love me now for sure. In the afternoon, I headed toward Jessie Lake with the hope that I could re-live some old memories by finding a school of Crappies to pick on. At the landing, surface temperatures were up to 59.5 degrees and the water had become dramatically clearer than it was a few weeks ago. Weeds appeared to still be standing. Fishing pressure on the lake was non-existent. On Jessie Lake, the search for a school of Crappies failed to produce the image I'd hoped for. I cruised along shoreline breaks for over an hour trying to encounter a pack of them, but on this particular occasion, Crappie location would remain a mystery, at least until I get back to cover some more real estate. Next stop was an examination of the weedline. Things went a little faster here, in fact, the first cast toward the edge of a Cabbage patch yielded a scrappy, 10-1/2 inch Perch. After that, the Perch action was hot and heavy and I think it would be easy to gather a mess for a fish fry. A 1/8 ounce jig tipped with a medium size fathead will do the job nicely. While the search for Perch didn't pan out, it did give me some advance information about where to find some Walleyes and the info paid off. Walleyes were scattered, but holding along the deeper breakline in the 22 to 28 foot range. There were some fish holding off the edges of sunken islands too, especially the ones near shore. The tops of the bars were habitiat for Rock Bass, but the deeper edges were home for the Walleyes. With limited time, I only used jig and minnow combinations for the Walleyes, but some of the larger hooks that I saw on the Humminbird, reminded me that this would be a good time to drop in a Creek Chub or Redtail on a Lindy Rig. For today, I think we'll take advantage of the breezy conditions. I'm going to keep checking some fresh lakes, so there's no telling where I'll wind up today. I'll pick up the crew at 8:00 and wherever we go from there, we'll be in Walleye mode! (10/6) On Lake Winnie and Cutfoot Sioux, Walleye fishing perked up for anglers on the South end of the lake on Wednesday. Persistent winds from the south helped keep fish on the move and Walleye fishermen were finding pods of fish anywhere from the Bird Houses on the West side, all the way East to Duck Pass. 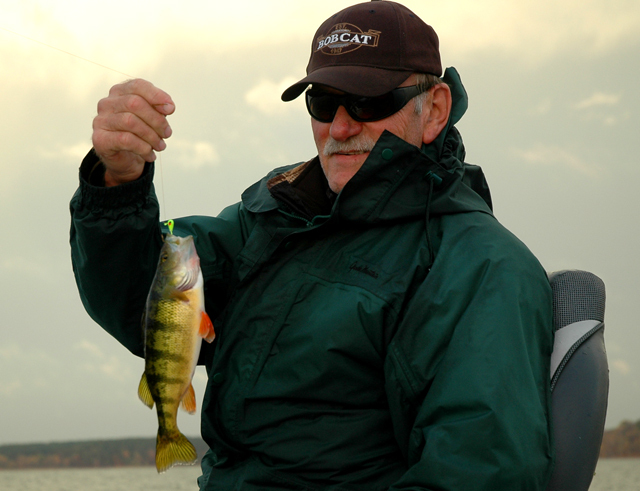 Shallow weedlines produced mainly Walleye, but Perch too in certain areas. Jig and minnow was the most common presentaion, but there are still a few anglers sticking with Worms. 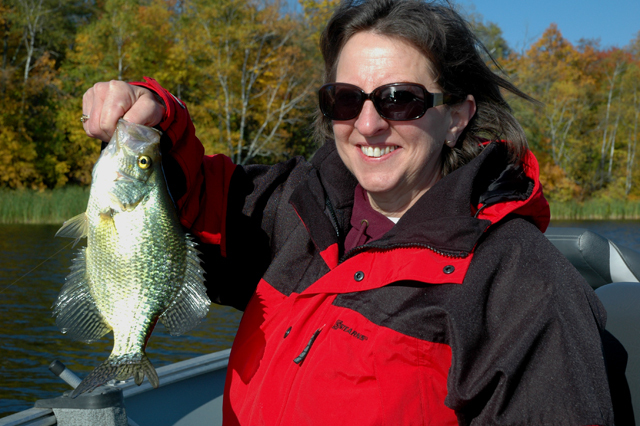 In Cutfoot, both Sunfish and Crappie action was good on Wednesday. Fish are getting more aggressive, so keep looking until you mark a pack, check them out and keep searching until you find that "fresh school of fish". 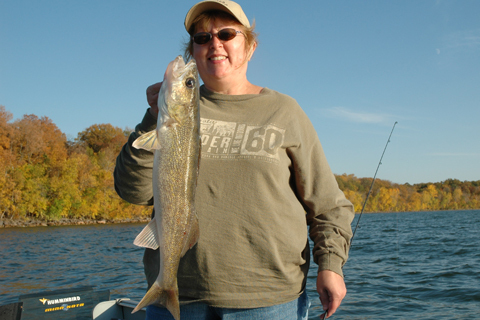 (10/6) On Bowstring Lake, Walleye fishing has been good according to Darv Oelke, Bowstring Shores Resort. 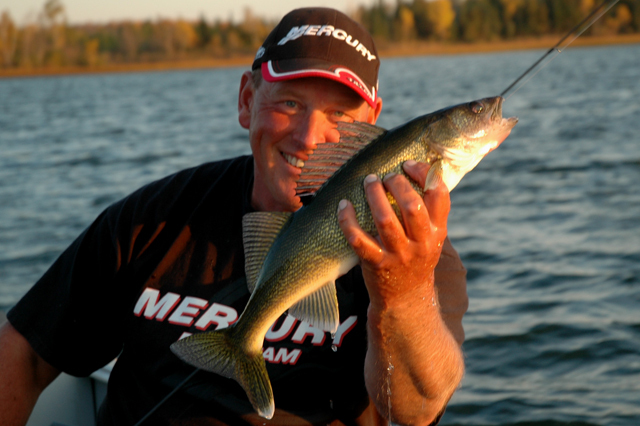 When I talked with Darv, he said that guests at the resort over the past weekend were catching Walleyes in shallow water, using jig and minnow combinations. He added that there's a lot of traffic on the lake right now, so other area anglers have discovered the action too. Another comment from Darv was about Grouse hunting. His guests have been coming back with good stories about successful hunts. Apparently, Grouse numbers are good, at least in that area. 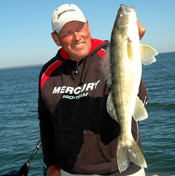 (10/6) On Leech Lake, Walleye reports were good again on Wednesday. The stronger South wind had fish on the move and fishermen are finding fish in small schools all along the East side. There are also good reports coming in about Stony Point and the rocky points in Sucker Bay. (10/6) Bemidji Lakes Area and NMLOG Member, Paul A. Nelson says; The fall colors in the Bemidji area are near peak this week, with fantastic weather so far in early October. The best viewing of the trees is often done from a boat on one of the many popular fishing lakes in the area, with the reflection off the water giving the fall colors a panoramic view. Surface water temperatures on the lakes remain in the upper 50s to low 60s, so the fall cool down on the lakes has been temporarily on hold due to the unseasonably warm temperatures. Area visitors are encouraged to make another trip “up-north” as soon as possible, before more seasonable weather arrives. The opportunities are great for a woods and water weekend in the Bemidji area, with great fishing and plenty of State and Federal land open for grouse and other hunting activities. Most fishing guides are very weather dependant this late in the season, with most having openings in their schedules for fishing trips on short notice. A half day trip is usually enough time to bring home a nice bag of fillets and still leave time for hunting or sight seeing. Walleye fishing has been good on most of the larger lakes, but there have also been good bites for muskies, pike, bass, crappies, sunfish and perch. In other words, everything in the lakes is biting, so anglers can pick the species they want to pursue and expect to have some success. The leaves on the trees are changing colors and falling fast on the days with wind. There are lanes opening up in the woods for grouse and deer hunting and the skies are full of ducks and geese, so there are plenty of opportunities for all types of outdoor activities in the Bemidji area this fall. Fishing Report October 5, 2011 Jeff Sundin Another tropical day in Northern Minnesota! A day that presented all of the classic multi-tasking opportunities. A little writing, a few chores, a little fishing and more! Then this morning, I slept in until 4:45, just like a vacation! An un-expected day off on Tuesday gave me some free time to catch up with a few chores in the morning, but I lined up an afternoon in the boat with Arne and Tina Danielson. I thought maybe we'd do something nice and simple, get a few fish for the fridge. You know, maybe some Perch, or we could get some Crappies, we might even go after some Sunfish. Tina was totally agreeable, we could fish for anything, AS LONG AS IT WAS WALLEYES! Well, with only a few hours to fish, I decided to take a chance on finding the Walleyes on Leech Lake, hopefully near the same area where we'd found them on Monday. When we arrived at the lake, surface temperatures were holding at 58 degrees, the sky was sunny and there was a slight chop on the water. Not the kind of waves I like, but still better than nothing. Our first stop was on a shoreline point in 10 feet of water. There were some fish, but not a huge school, just enough to keep us in the area for a while. We picked up a fish every 10 or 15 minutes for a while, but evenually curiousity got the best of me and I had to go looking for something faster. At the second spot, Arne caught a 20 incher almost immediately and it raised our hopes that we'd find more. Here though, I could see fish on the screen, but it was like pulling teeth to get a bite. It was time to make one final move. The last stop is where I discovered that we had probably missed getting in on what might have been the "main" school of fish, the ones that we'd been chasing around since last Saturday. Other anglers told us that there had been some fairly good action in this area earlier, but by the time we arrived, it was getting late and the action was winding down. We managed to catch a few more fish on this spot, but soon everyone was gone and we looked up to see a dark sky, signalling the end of our day too. Overall, it was agood afternoon, the 3 of us had found faster action in the past, but still, with only 4 hours on the lake, we managed to boat a dozen or so Walleyes and we couldn't have asked for a nicer evening. With a little more wind, the bite would have been better and I am looking forward to a re-match really soon. Presentation was less aggressive than on Monday. The fish preferred a softer, more subtle jigging apporoach. A little hop followed by a pause, triggered more bites than did the rip-jigging that worked so well the previous day. With less wind, we found 1/8 ounce jigs had an advantage over the 1/4 ounce size. (10/5) On Lake Winnie and Cutfoot Sioux, Walleye fishing is still really spotty. Anglers are struggling to figure out why the Walleyes won't kick into their fall patterns. Like everyone, I have my own theories. 1) Fishing was so good on the popular lake earlier this season that the fish were their own worst enemy. The bite was fantastic for the first 2/3 of the fishing season and I think that some of the cream has been skimmed off. Even a slightly depressed fish population can make for a tough bite. I've heard one famous fish biologist say that a 6% shift in the baitfish vs predator relationship and be the difference between wide open action and Walleyes having severe lockjaw. 2) High water during the early season tends to favor good production of baitfish and small game fish. With a lot of extra food in the lake, Walleyes can be more selective about when they feed. 3) Strange weather patterns for this time of year are forcing all of us to re-think Walleye locations. I know that there are thousands of fish suspended right now. Many of these suspended fish are Walleyes and many of them are catchable. We're just not tuned into these patterns and I'd be willing to bet that folks who fish on lakes where fish are often suspended, could teach us a few tricks for bagging some of these fish. 4) There is an increasing amount of netting occurring on Winnie these days. Right or wrong isn't the point, it is however, additional pressure on the fish population and it should be at least mentioned. Luckily, Lake Winnie has a lot of other good things going on right now. 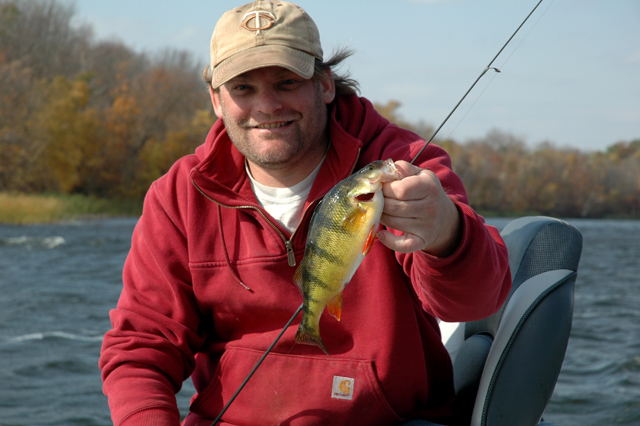 Perch, Northern Pike and panfish are all in reasonably good supply and anglers seeking a fish fry have more than adequate supplies of fish. Read through some of the recent reports and you'll find everthing you need to point you in the right direction. Fishing Report October 4, 2011 Jeff Sundin The mission on Monday was to try and get serious about bagging some Walleyes. 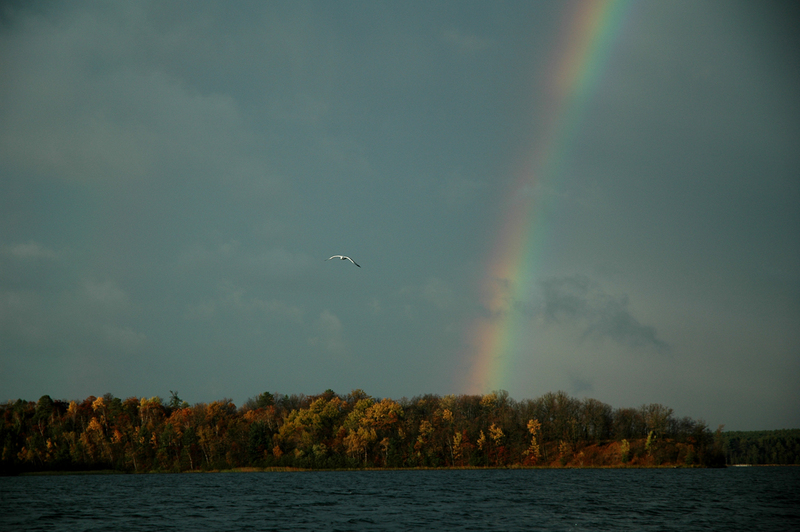 The weather forecast wasn't perfect, but if the breeze broke in our favor, we could have a good day on Leech Lake. It took some effort, but eventually the wind did help out and once we figured out the best way to take advantage, the Walleyes got pretty darn cooperative. When we arrived, the conditions were bright, sunny and calm. Surface temperatures were 57 to 58 degrees depending on the location and remained in that range all day long. After a really brief stint along the main breakline outside of Federal Dam, it was beginning to look like we might get a little breeze. We high-tailed it down to Sugar Point with the intention of working back, spot by spot toward Federal Dam to wrap up the day. At Sugar, there was already a small crowd and with flat conditions, working between the boats wasn't very appealing. I decided to work my way down to a secondary point where there had been a school of fish on Saturday. There were still fish there, but the problem was that except for one phantom 27 inch fish, the rest of them ranged in size from 10 to 12 inches. Maybe great news for the next season, but no real reason to stick around. By now, the breeze was kicking up, but it was blowing off shore and I decided to head West to try and get into a little heavier waves. We stopped at the Annex and at Submarine Island, neither held any Walleyes but if you're an Esox fan, you might want to take a look. Each time I marked a fish on the graph, it bit, they were all Northern Pike, but I also saw a couple of those spooky looking giant marks on the screen. Maybe there are a couple of Muskies lurking on those rocks too. Next, we fished several stretches of water between Ottertail and Two Points. There were fish there, I could see them on the screen and we did boat another 26 inch fish, but the rest of the Walleyes on this side seemed to have lock-jaw. My timing wasn't good, at mid-day there wasn't any great way to make a decision. If I waited for an evening bite, we might spend several hours doing little or nothing and by now I'd gotten a heads up from my buddy Vern Valliant who said the fish were perking up over on the East side. Okay, so we packed up and went back accross to the East side. The ride accross was rough because by now the wind was kicking up into the 15 MPH range and there was a good chop on the lake. As soon as we stopped, we could see some of the other boats dragging in an occasional fish. I was seeing fish too and we took a position just outside of the pack. It seemed odd that no matter how many fish I was seeing on the screen of my Humminbird, the best we could muster was the occasional half hearted bite. We'd catch a fish here and there, but it seemed like we could do better. It dawned on me that maybe we were using a little too much finesse. it wasn't until I tied on heavier jigs and picked up the trolling pace that we started getting more hits. In fact, the speed was fast, 1.2 to 1.4 MPH and we were ripping the jigs as hard as we could, the more aggressive approach made the Walleyes mad and they began to strike like a ton of bricks. It's hard to say for sure, but maybe if we'd tried this on the West side, the results would have been similar. Maybe the action just improved because of the wind or maybe it was the influence of evening setting in. Either way, the afternoon turned out great. We were one short of our limit of keeper size fish and we'd tossed back a half dozen big fish and a bunch of small ones too. The presentation was 1/4 ounce jigs tipped with Shiners. Fish were holding on the shoreline breaks in 9 to 12 feet of water. The more aggressive the jigging approach, the better the fish responded, so don't be afraid to snap, pop and hop the jigs along the rocks. Fishing Report October 3, 2011 Jeff Sundin Come to Northern Minnesota and beat the "October Heat"? Here we go again! 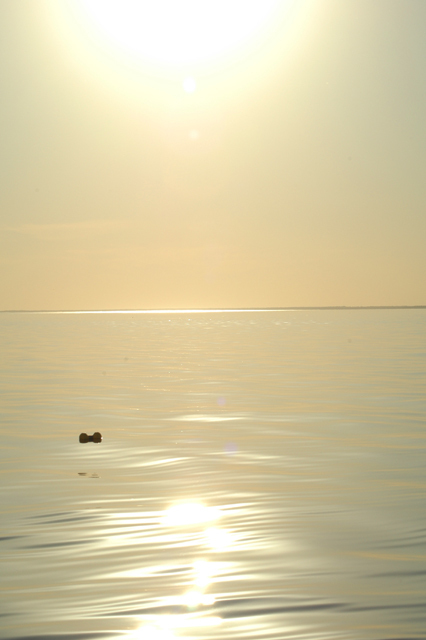 Flat calm seas, bright sunshine and bugs biting our arms. That's not right! 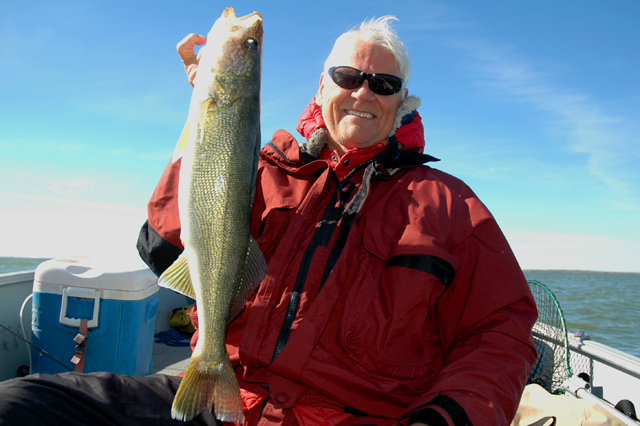 Walleye anglers on Lake Winnie and Cutfoot Sioux could be a little happier these days. Constantly changing weather and a lack of any major Walleye migration into Cutfoot has been a disappointment to anglers visiting the normally reliable fall destination. Fortunately, Perch, Sunfish, Crappies and Northern Pike are pitching in to help take up the slack and versatile anglers are still finding ways to make their trips interesting. As I was dropping my boat into the lake and saw Erl Hommedals smiling face coming toward me, my first thought was, it's going to be a really nice day! Erl and Karen have become good friends and days with them go by really fast for me. I knew it wasn't going to be the best Walleye day, but luckily for me, they were happy to fish for Crappies, Perch...whatever bites. Also lucky, many of those did. On Lake Winnie, I noticed surface temperatures were back down to 55 degrees as we rolled through Tamarack Bay, heading for Cutfoot Sioux. In Cutfoot, temperatures popped back up to 59 degrees. At first, the air temperature was cool and there was a little chop on the surface. Nice conditions for Crappie fishing. So starting what has become an almost daily milk run for me, we headed first for some Crappies on the North side of Cutfoot. Today they were in 25 to 27 feet of water, some of them were strung out along the bottom and broken up into singles and doubles. We also found a few small packs of fish and worked on them until we'd gathered ten or so. We could have kept working toward getting a limit, but these days, it makes more sense to keep prowling around, looking for whatever the best opportunity is at the time. Next stop, Shallow water and hopefully a mixed bag, maybe. I stopped on a shallow point where a clear stretch of gravel is hidden inside a huge weed flat. Many times there are a few Walleyes holding on the gravel, but not today. This time there was a nice run of really gorgeous Jumbo Perch. We took advantage of the opportunity to get some fish for the cooler and stayed on the 6 foot deep, clear spot for over an hour. We used a 1/8 ounce jig tipped with any kind of minnow we could find, it didn't matter at all what size, shape or breed. The hungry Perch just wanted meat. I'm not sure why I left, but I did. I wanted to try and find some Walleyes so we headed for another shallow, gravel point, got set up and within a few minutes Karen boated an 18 inc, slot fish. On the first pass, there were lots of fish showing on the screen of my Humminbird, after we trolled through, they disappeared into thin air. Typical of what's been happening lately, the calm, sunny weather had encouraged the finicky fish to scatter. Against my own better judgement, I made a move out on to Winnie hoping to get into a lttle action in deeper water. We headed out across the lake toward the Bena Bar where there has been sort of a bite in recent days. My timing wasn't too good for this move, as we got to the area we wanted to fish, there were a dozen, maybe more boats strung out along the break. The problem was that I missed out on what appeared to be a bite that occurred earlier. One by one, these boats were leaving and within 10 minutes they were all gone. I marked a few fish, so we gave the spot a half hour, hooked one decent size Northern, but no Walleyes. We headed back toward the shoreline and fought the calm conditions all the way from Musky Bay to Tamarack Point. There just wasn't a Walleye bite happening, at least not for me. Looking back on the day, we would have caught more fish had we stuck to the Perch and Panfish, but we just had to try the Walleyes. In spite of the fact that it's October and that they're supposed to be "biting", I think we're just going to need to pick our days. When we get a good breeze, things get better, but if you get stuck with a calm one, just go ahead and work the shallows for Perch, deep for Crappies and middle for Sunfish. When you're done, go home and have a great fish fry! For today, it's Walleye or die and the forecast looks like something I'd read in July. Sunshine, 83 degrees and South winds at 5 to 10. Hmmm... Let's see if I can figure out something to do about that. Fishing Report October 2, 2011 Jeff Sundin The winds were a little stronger than expected, but Leech Lake was still fairly manageable on Saturday. Whitecaps pounding into the shoreline encouraged the Walleyes to get out and move around. Patient anglers enjoyed random encounters with small packs of fish that were moving along the shoreline. When we arrived on the East side of Leech Lake, I was surprised to see the whitecaps pounding onto the shoreline. The predicted 5 to 15 MPH wind was already blowing at 20 MPH and I could see that a long boat ride was going to be out of the game plan. Surface temperatures in the shallow water were just above 55 degrees and my hope was that with a little luck, we'd be able to find a fishable stretch of real estate close to the boat ramp. At the ramp, we talked to a couple of Walleye fishermen who were loading bait into their boat, when I asked how they were doing, one of them grinned and said "they were bitin' yesterday!" Luckily, the were bintin' again today too and we were able to keep ourselves entertained without ever venturing more than a half mile from the landing. It wasn't hard to find our first school of fish, they were in 7 feet of water and began hitting about 10 minutes after we started drifting. You could see that the action was good because lots of other boats were reeling in fish, but the nomadic fish forced fishermen to keep checking new depths. Depending on the time of day, we had one reliable drifting pattern set up in 7 feet of water, another in 9 feet and a deeper one at 12 feet. The schools of fish would appear, seemingly from nowhere and when they did, the bites were aggresssive. Typically, the action would stop as fast as it started and then there would then be another lull as we looked for more fish. Presentation was a 1/4 ounce Lindy Jig in the glow blue color tipped with a Shiner. The minnows we had bought in the morning were a hodge podge of Spottails, Golden Shiners, Lake Shiners and some of the long, slender Emerald Shiners that have recently shown up in Lake Winnie. All of the minnows we used were working and it was really hard to discover whether the fish had a preference or not. 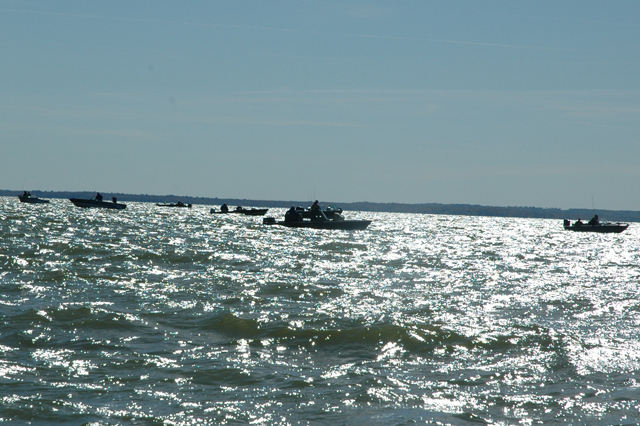 From where we were fishing, I could see other groups of boats who were hanging tight to likely Walleye spots. My guess is that other fishermen were also finding action and sticking with their spots as well. If the action is typical of past years, Leech will like be a good producer from here on out, especially on the breezy days. Fishing Report October 1, 2011 Jeff Sundin Hey! Welcome to October! ... and the baby bear said this porridge is well, almost just right. The morning breeze was just what the doctor ordered. It was little cold, but it had the fish snapping and for a couple of hours, we couldn't hardly get our baits into the water without having to either reel in a fish or re-tie a jig after being snipped off by the aggressive scissor bills that were roaming the shallow, weed flat. Thursday's blustery wind gave way to a brisk, but much more manageable Northwest wind of around 15 MPH, maybe less. The surface temperature on Cutfoot Sioux was locked in at 57 degrees and stayed in that range for the rest of the day on Friday. Wrapping up a three day session with Kyle and Karen Reynolds, we were sort of filling in the gaps of Karen's fish stash for the winter. We wanted 3 Crappies, so we made a quick stop where we'd found some fish on Thursday, picked off 3 fish and then made our first move. I wanted to try a shallow weed point where I've had good luck in the fall before. This time, I really stumbled into 'em, we never hardly had a chance, the fish were hitting so fast that it made all three of us forget the fundamentals. All of us missed our first half dozen fish because the hard hitting strikes made us think it was time to set the hook, but we were snatching the jigs away from the fish before they could swallow the bait. It reminded me of trying to stay calm and fish with a swarm of bees buzzing around my head! Finally, we did settle down and soon, we figured out what was happening. A huge school of Jumbo Perch was sitting on top of the shallow gravel stretch located on the inside edges of the weeds. There must have been a huge pile of baitfish on the point too, because there were also a ton of Northern Pike. For a while, I hovered on the point with the MinnKota, but eventually anchored and fished this one spot for at least another hour. It was great fun while it lasted, but eventually, the bite dropped off and we headed out on a mission to find some Walleyes. As we began ttrying a couple of spots in Cutfoot, the wind decreased steadily and after a time, the lake was back to flat calm. Mirror glass calm, the kind of conditions that have been a struggle for the entire 2011 fishing season. Today was no different. The calmer it got, the tougher the fish became and we bailed out of Cutfoot, hoping to get some action on the deep weed edges on Lake Winnie. Working up the North Shore, just West of the gap, I slowly trolled the weed edges in 8 feet of water and within muinutes, Northern Pike were jumping on the jig and minnow combinations. Maybe the Pike fishing was a little too good, about 2 out of 3 strikes resulted in me tying on another jig. There were a few Walleyes mixed in, but I'm not sure how many of them ever got a chance to see our baits. We did manage to catch a few, including a nice 24 incher caught by the Angling Queen, Karen. The rest of our fishing experience reminds me of what we've been doing all week long, so I'll cut it short here and let you read the reports from earlier this week. After that, you'll know everything you need to know about Winnie and Cutfoot. One word of advice though, if we get the predicted South wind for today, don't forget the comments I made a few days ago about fish located on the Bena Bar. That could be good on a south wind. The South wind could also easily trigger a re-birth of the action that we had on the East side. Anywhere from Tamarack Point, all the way down to Duck Pass could turn on if the redicted wind arrives. For most of us, jig and minnow fishing is a welcome change in the fall, but if you're a dyed in the Wool Lindy Rigger, there are still fishermen catching Walleyes using Night Crawlers. (10/01) On Lake Winnie , Walleye fishing was off to a slow start on Saturday morning, according to NMLOG member Jim Trombley. I talked with Jim a few times during the day and after it warmed up, the action started getting better. The Walleye action has been fairly good on the eastern shoreline when conditions are good, and the Strong South winds were helping on Saturday afternoon. I have a trip on Winnie today and if the predicted calm seas comes true, then I'll probably head for the deeper water to see if I can pin down the fish that were roaming on the larger, main lake bars a few days ago. (10/01) On Cutfoot Sioux, Walleye anglers are having their ups and downs. Sometimes, one new school of fish moves on to a spot, but it doesn't take long for action hungry anglers to show up and work them. It's beginning to look like the best strategy is going to be fishing early morning and late evening. 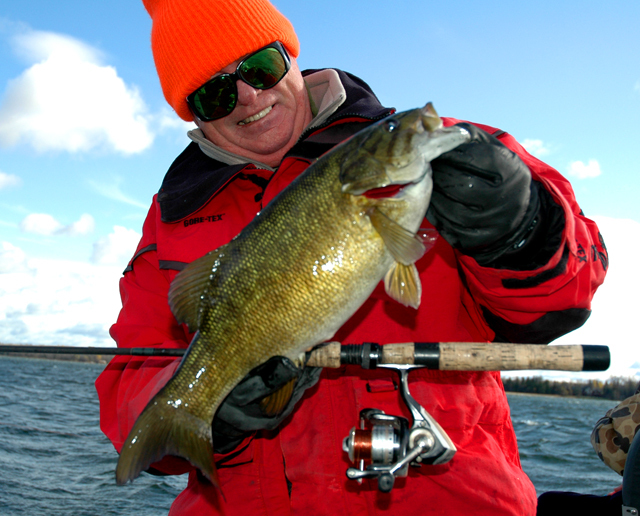 Even then, the action isn't going to live up to a typical fall on the usually reliable lake. In part, due to the slower than average Walleye fishing, Crappies have been getting a lot of attention on Cutfoot and according to Bill Powell at Fred's Bait, EVERYONE was buying Crappie minnows on Saturday. If you're headed up for that, be prepared to do a little head scratching as most of the fish in Cutfoot and Little Cutfoot are getting plenty of attention. Advertise Here! Email Me More Fishing Reports? >> Click Here For The Fsih Report Archives << (October 2011) Smiles are always welcome! I AM. !! Chris Andresen with one of the many "slot-fish" we caught on Monday. Jig and minnow combinations in 10 feet of water produced lots of these today. It goes faster two at a time! 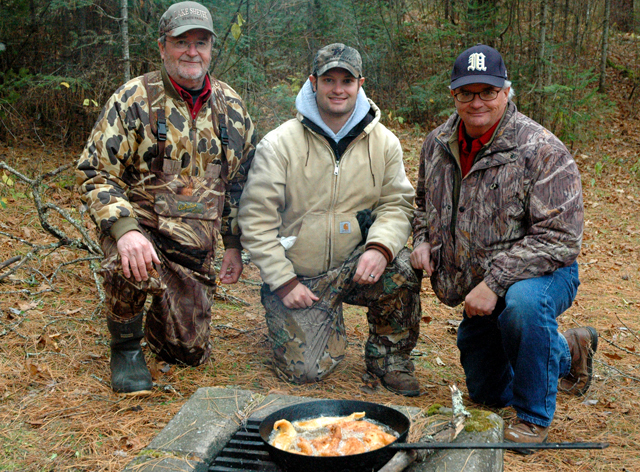 Above: I and Paul Espeset with a pair of scrappy Walleyes. Below: Bob Espeset and I ditto that! Cold water and calm conditions didn't phase them, they held their ground in 8 feet of water. It was more work than usual, but walk off enough shoe leather and you'll find 'em. Walleyes favoring a stretch of shallow rocks kept Bruce entertained for most of the afternoon. 1/8 ounce jig and minnow combos did the trick. Just enough to prove that they were there. Blustery, Northwest winds killed the boat control, saved the Crappies. Fall Walleyes want meat! Click image for a closer look at the size of that Creek Chub. Lindy Rigs with Creek Chubs in 35 feet of water, Below: The 23 incher above ate this 8 inch Creek Chub. This is nowhere near too big, for luinkers, using a 10 inch minnow is no problem! Rigging with Night Crawlers was working for a few Walleyes, but the Smallmouth Bass really liked 'em better. Capt. Mike Rehr knows how to get 'em, ya just have to have the right attitude! Lucky we're on the calm side! A little added day brightner for putting up with the cold wind. Smallmouth Bass are alot like Walleyes, wind gets them roaming too! The dominant year classes are 19 to 21 inch fish. Lots of fun to CPR! Jig and minnow combinations on the rocks in 8 to 12 feet of water. Smallmouth Bass helped take up the slack in more ways than one! I CPR'd this one that stole my minnow before a Walleye could find it. You'd smile too if your nickname was HAMMER! David Chrz with a Silver, Leech Lake special! This portly 26 incher hit a jig and minnow on the weed flats, in 13 feet of water. The Norwegian Hammer, gets us into some action! Good call Eldon! Coots were rafted up everywhere on Blackduck Lake. Leaves are down and the sky is Grey, hunting is just around the corner for me. Tom Ryan with what turned out to be the big fish for Saturday, a 21 incher caught in 10 feet of water on a jig and shiner. Chris Andresen bagged this dandy Crappie on his first drop into the water. We planned to go back and try them again, but windy conditions kept us away. Luckily the Jumbo Perch were more tolerant of the wind and kept us occupied for the day. Shallow water weeds and jigs tipped with fatheads was the best combination. 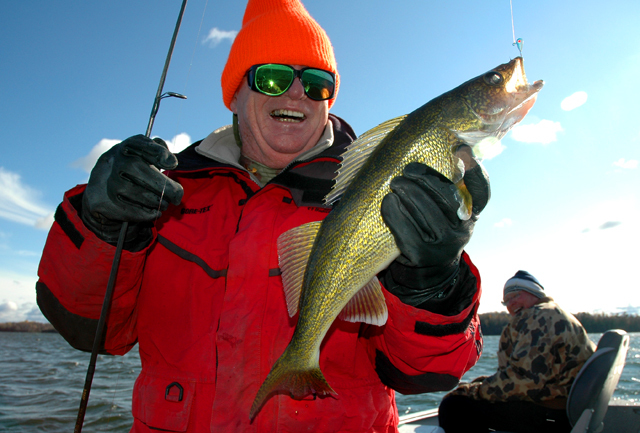 Windy conditions help fill shallow rock flats with hungry Walleyes. Jig and minnow combinations tossed into 6 to 8 feet of water did the trick. Justin shows of the result of one of his better efforts. The 21 inch Walleye, was CPR'd! Nice weather and improved fishing conditions have fishermen coming out to take advantage! 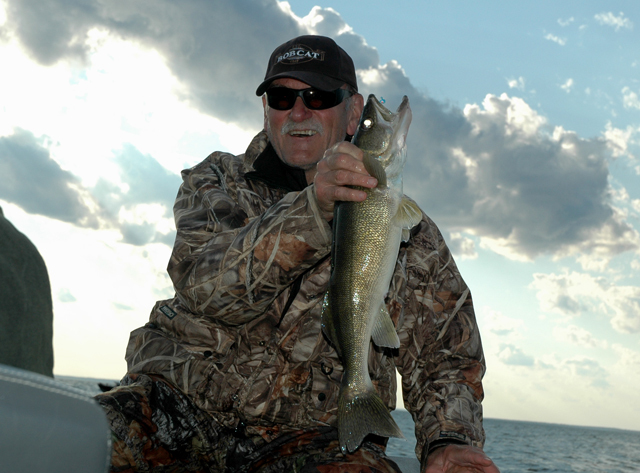 Not a bad way to spend an evening, Arne Danielson in action with another Leech Lake Walleye. Tina Danielson with a nice Leech Lake special! Jig and minnow on the rocks in 10 feet of water! No problem! above: Bruce Champion stages one of his typical late inning rallies! 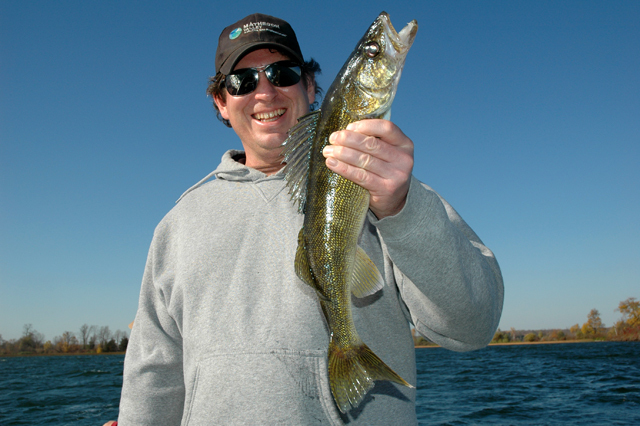 Walleyes on Leech Lake were a mix of small, medium and larger slot fish like these. Below: Jeff Sundin adds his two cents worth too. Trolling at 1.2 to 1.4 MPH, ripping the 1/4 ounce jigs and the Walleyes loved it! 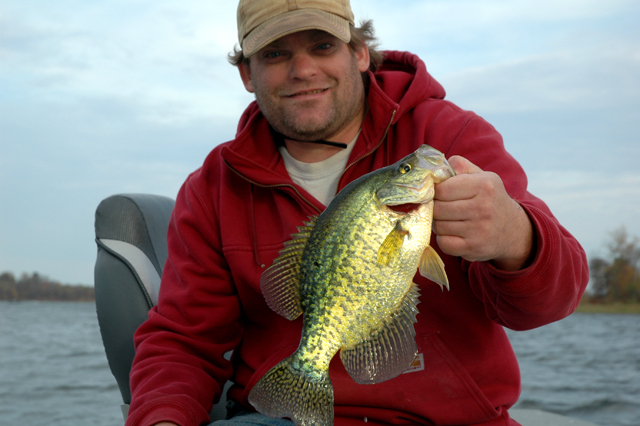 Crappies are among the fish helping to put smiles on our faces. Karen Hommedahl bagged this one on Cutfoot Sioux. I thought you said October? October, right? The warm, Southerly wind encouraged Walleyes to go out on the prowl. Bob Carlson, released this 27 incher caught on a 1/4 ounce, Glow/Blue Lindy Jig tipped with a Shiner. Bumpy, but fishable. 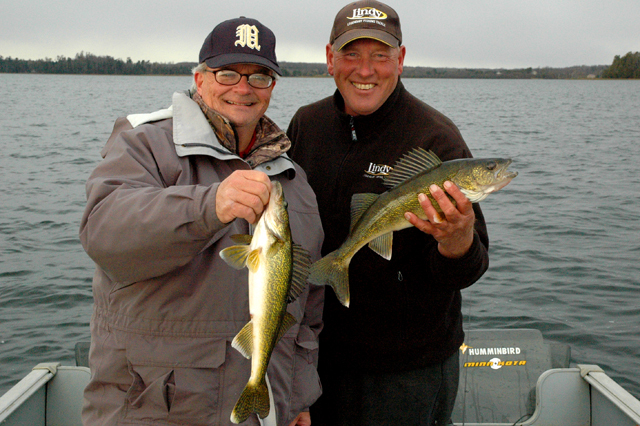 The whitecaps on Leech Lake didn't chase these Walleye fishermen away.